High on the list of a mountaineer’s favourite substances, right up there with sun-baked granite, porridge*, and wick-away underwear, we find spring snow – ‘winter snow with a tan’ one might almost say – that lovely consolidated stuff which covers the mountain sides after the powder is gone and before the flowers (and bush) reappear. Spring snow! You can walk on it! You don’t need skis or snowshoes, just step up the slope in the little pockets, the mini sun-cups whose edges are outlined with wind-scattered needles and pollen – overhead not a cloud and the morning sun is gilding the beckoning mountain-tops. The terrain becomes steeper, a gully perhaps, and you tie on the crampons, a gleam in your eye as you tiptoe to heaven – that line where the white meets the blue. On the summit you bask in the sun, no need to rush away. Might anyone guess, looking at the cap pulled over your eyes, that yours is no idle idleness? At last it is ‘down time’. Crampons stowed safely in day-pack and ice-axe in hand you step, nay leap with a yell onto the sun-softened snow! There are days when to live is to boot-ski. Steady, in balance, link turns, steer round a rock, jump a small moat and everything works, what a ride! You get off, one might say, on the gravity of the situation. The conventional wisdom regarding glissading is, however, rather more conservative. There are, we are told, three types of glissade – standing, sitting, and uncontrolled – and they usually follow each in rapid succession. Many of you probably spent, as I did, long wintry hours sliding down hills with various friction-reducing devices intervening between the snow and your childhood buttocks. I am writing about having fun. I do not wish to tell you now that this, upon your having grown up, has suddenly become a reckless and hazardous thing to do. Nevertheless, those of you who have, even once, poked yourself in the eye with your toothbrush, (and probably those of you who haven’t) would undoubtedly concede that every activity is potentially dangerous, and that ‘forewarned is forearmed’. All this is to introduce some comments and tips from an inveterate glissader. I first learned to glissade on my bum. It was great fun, but I wondered why so few people would join me. Then I discovered my jeans were all wet and that holes had been worn through to my wallet. The advantage, though, was that over a couple of winters of sliding at every opportunity I got a lot of practice at maintaining and controlling a self-arrest with my ice-axe. It’s important to be able to stop. Bum-glissading is for the army-surplus woolies, or cheap nylon rain pants for a faster drier ride. A sitting slide on hard snow definitely constitutes misuse of your new breathable-fabric overtrousers. And make sure you wear your gloves or mittens. It’s not true that snow can’t draw blood. Then there are the times you come to a tempting glissading slope and you are still wearing your crampons. Resist the temptation or remove the crampons. Yours knees and ankles will last longer that way. You must, of course, evaluate the likelihood of your little frolic starting an avalanche. On good spring snow this is usually not a problem, but if the sun has created a substantial layer of loose wet surface snow then it becomes more of a judgment call. Err on the side of safety. Obviously it is possible to have a really nice bum-slide in the powder of winter. I remember a wonderful thousand-footer that I did in Switzerland some years ago. Far from braking with the ice-axe, I was using it like a kayak paddle to accelerate my descent. The skiers could not keep up to that one, and the peculiar single broad track straight down the mountain-side became the topic of conversation of the amused and bemused observers on the sun-deck of the hotel below. Glissading, like driving and diving, is much safer if you can see where you are going. Fortunately most of us are not called upon to make life-or-death choices such as led to the glissading epic of Ernest Shackleton and his two companions during the dramatic first crossing of South Georgia Island in 1916. They glissaded into gathering darkness without knowing whether or not the slope ended in a cliff, without the benefit of even one proper ice-axe between them, and they lost, according to one participant’s recollection, nearly three thousand feet of elevation and covered a distance of about a mile. They gambled and won, though they shredded their trousers in the process. Those of us who glissade under more mundane circumstances should probably consider the game too risky if we can’t see, or don’t have prior knowledge of, the whole slope right to the run-out at the bottom. Sliding blithely over a cliff or into the top of an unexpected couloir can ‘ruin your entire day’. Icy patches and frozen snow in shady spots can accelerate you painfully and make stopping impossible. It is easy to misjudge the true fall-line of a snow slope. If in doubt, roll a snowball down first. (Even this isn’t foolproof.) When a glissader collides with a rock or a tree the laws of physics are obeyed, and they favour rocks and trees. Beware of holes and moats near rocks, as well as crevasses and bergschrunds on glaciers. A hole might grab only your lower leg, but will want to keep it while the rest of you tries to go sailing past. But what about the standing glissade, or book-ski as I prefer to call it? There is a classic glissading position described as standing in a half-crouch, one hand on the head of the ice-axe and the other on its shaft, with the spike of the ice-axe trailing behind you as a rudder and a brake. I have actually seen a few people doing this well. Nevertheless to me it looks and feels unbalanced and is strenuous to maintain. My own preference is to stand fully upright and ‘go for it’, holding the ice-axe in one hand yet at the ready to go into a self-arrest if necessary. If inconsistent snow makes balance a problem it is possible to gain stability by dragging the spike, (the bottom end), of the ice-axe behind you, hanging on to its head or upper shaft with one hand. When doing a sitting glissade you can slow down by rolling to the side in the self-arrest position or, in softer snow and with the same hand positions, simply press the spike of the axe into the snow beside your hip. If you have new boots you will have trouble boot-skiing. The edges of the soles are too sharp and grip too well. A few weekends of rock-glissading (scree-running) should solve this ‘problem’. H.W. Tilman had his memorable bathes, I have my memorable glissades. One I have already mentioned. Another took place one summer evening in the gully below the north snow-field on King’s Peak, Vancouver Island. The snow was perfect and there was even a small crevasse to jump over. I remember one day sun-bathing for over an hour on top of Mt. 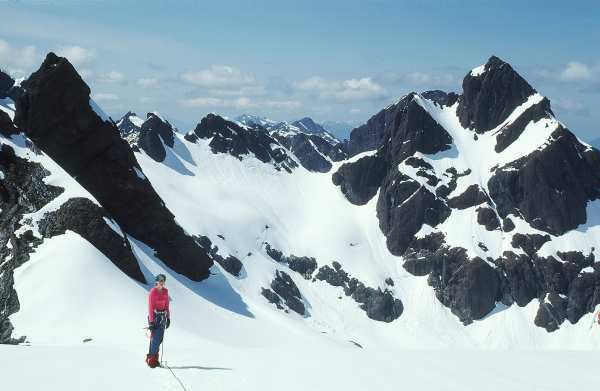 Slesse and later, after a rappel, boot-skiing rapidly down its upper slopes on a serious of six-foot steps. Then there was the long natural luge-run leading to Shovelnose Creek from the ridge north of Mt. Fee. In many places spring snow lasts well into summer, and no patch is so small as to be overlooked by a true enthusiast. Glissading the walls of sun-cups can help break the tedium of a long march. I have read that even the mighty polar bear has been known to slide repeatedly down a hill for no other discernable purpose than to have fun. Let us guard against taking ourselves too seriously, that we too may follow this instinct – to go out in the snow and play. *I was kidding about the porridge.